The blog prompt in my inbox this morning was as such: “You’re 12 years old. It’s your birthday. Write for ten minutes on that memory. GO.” I rarely roll with these prompts, but every once in a while, one strikes a chord. To be honest, I can’t remember anything about my 12th birthday, and I have no desire to write about it. I’m sure there was a cake with oodles of icing. I’m sure I was hoping Taylor Hanson would show up on my doorstep to sing “Happy Birthday” (yep, I was one of those). There may have been a couple of friends around. But I know this much: it wasn’t the best time in my life. I don’t pine for those lost days of my youth. Rather than write about that memory, I’d rather get in touch with 12-year-old Rachel, enlighten her with some of my oldness and wiseness. I know, I know. I’m sensing all the eye rolling right now. I get it. I’ve got a long road ahead, to be certain. But I’m leaps and bounds ahead of me, age 12. 1. When people laugh at your expense, laugh with them. Or smirk and walk away. They’re really just looking to get a rise out of you. Don’t give them the satisfaction. Believe it or not, some of these people will be friends of yours in the years to come. Hint: this strategy works with adult meanies too. 2. As cheesy as it sounds, when you look in the mirror, smile and acknowledge everything that’s beautiful about you, especially the inner stuff. When you tell yourself you look ugly, your brain gets ugly. And it starts making you believe it. And it can be a hard thing to get over. When you get older, every single woman you talk to will tell you that she hated how she looked at your age. She’ll probably tell you that she hates how she looks now. Don’t be that person. Compliment other people, compliment yourself. Life’s too short to get hung up on bad hair days and pimples. 3. Embrace what you love to do, even if it makes you a nerd. Embrace your nerdiness. Spending Friday nights at home with a book (and a glass of wine when you’re old enough!) instead of at a party is pretty cool. And it might just lead you to a career you don’t even know exists right now. No, you’re not going to be a famous rock star or an MTV personality. That’s OK. That would have gotten old for you really quickly. 4. Understand that your life is not going to be “white picket fence.” There is no formula, though it’s hard for you to see past that ideal right now. Hell, it’s hard to see past that ideal when you get older too. Start changing your mindset now. There is no right way — there’s only your way, so start dreaming big, kiddo. What do you want your life to look like? 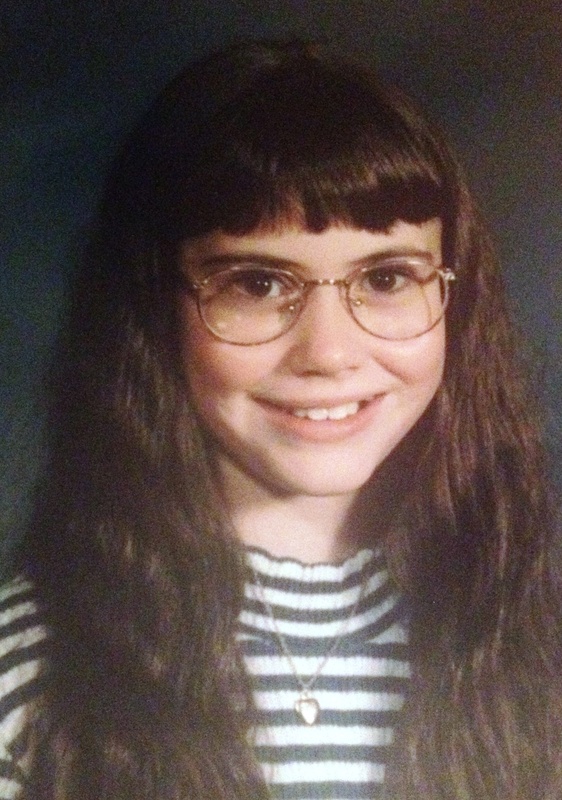 What would you tell your twelve-year-old self? Are you living the life he or she hoped you’d be living? Awwww, what a cute picture! Much better looking than mine. 🙂 I think we all suffered from #2 growing up. Sooner or later I believe we get it straight in our heads. There is always someone somewhere that would like you to show up singing on their birthday. Ok – so maybe the glasses are geeky by today’s standards, but they were in style then – and I STILL say the kid wearing them was very cute. Remember the Radisson? I marvel at your wisdom for your age – took me much longer to get there – still may not be quite there. Are you following your own advice on a daily basis? some of my 12-year-old dreams came true and some didn’t. What do we know of life at 12? No matter what you end up doing, life will have hard times when you’re living your dreams and will present you with unexpected good stuff while you’re waiting for them. The trick is learning to appreciate it all. Pretty cliché, I know, but a hard trick to learn. Keep at it. Thanks, Janet 😉 Though I still say you have to say that. I can’t say that I follow my own advice on a daily basis, but I hope that by getting it on paper, it will continue to be a work in progress for me. And cliches are cliches for a reason. One day, one moment of joy at a time! I think, mainly – It’s never personal with the world. S*** happens and you just get on with it. As soon as we think it’s personal, everything starts to look like a conspiracy against us. Yes, and everything looks like a conspiracy against us when we’re teenagers! I know…there is no more Oprah really. Thank you so much, Wendy *blush* You inspire me as well. Great post! I would also like to tell my 12-year-old self #1. P.S. You were DEFINITELY hoping Taylor Hanson would show up on your doorstep (I remember feeling the same way about JTT, minus the singing part). This made me smile. Thank you. I especially liked #3. I was a nerd and never really cared. Now I laugh when all my “cool” contemporaries post something on FB about their kid being in band or chess club or whatever and then hasten to add–“but it’s cool!” I think the only ones who think being cool is a big deal are the cool kids. Thank you so much for reading! Yeah, it’s very amusing to see how people’s definition of “cool” shifts over the years. I went everywhere by pushbike and spent a lot of time fishing and playing football on my own, complete with commentary. Not much change then, apart from the fishing, because I’ve gone a bit soft on ‘living ‘things’.